Prepare the brownies: Preheat oven to 325 degrees F. Spray a 9x13-inch pan with nonstick spray. In a medium glass bowl, melt chocolate in the microwave in short bursts of 30 seconds; stir after each burst and remove from microwave when melted and smooth. Set aside to cool slightly. In a large mixing bowl, whisk together the butter and brown sugar. Add the eggs and vanilla extract and whisk those in too. Mix in melted chocolate. Whisk in the flour and mix just until combined (don't over-mix). Spread batter into prepared pan. Bake 25 to 35 minutes. Watch closely and remove from oven when toothpick inserted into the center comes out clean. Let cool completely. 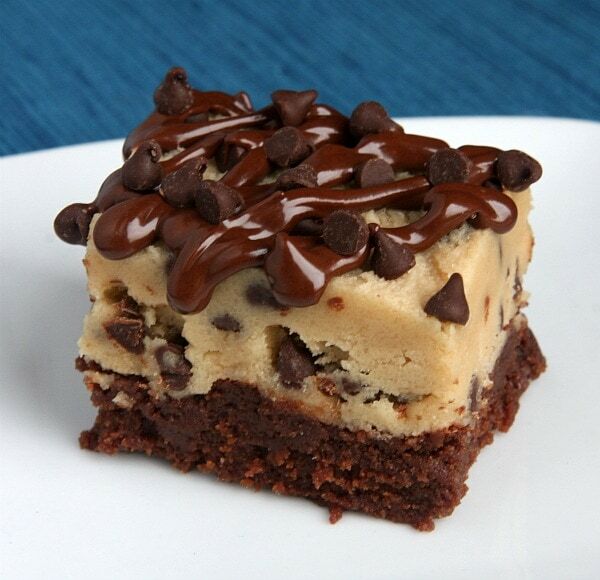 Spread cookie dough over the cooled brownies. Refrigerate until the dough is quite firm. It's okay to speed up the process and place it in the freezer too. The firmer the dough, the easier it will be to cut into neat squares. Use a sharp knife to cut the brownies. You may need to wipe the knife off with a paper towel in between cuts since the fudgy brownies and cookie dough will tend to stick to the knife a bit. These brownies are best to serve placed inside cupcake papers and served with a fork. If you'd like to add chocolate drizzle on top, melt 1/2 cup chocolate chips with 1 teaspoon of shortening in the microwave; stir until smooth. Scoop the melted chocolate into a zip baggie and snip off the corner. Squeeze the bag to drizzle the chocolate on top of each brownie. Sprinkle additional chocolate chips on top, if desired. I have tried this and this is one of the best brownies I have tasted in a while. I have also recommended this to some of my foodie friends and hope they will like this as well. fine dining boise also provides a great quality of brownies and they are my favorite.